George Eliot is the pseudonym created in 1857 by the aspiring writer Marian Evans. In a letter to her publisher William Blackwood, Evans suggested that the name George Eliot should be assigned to her work in place of her own. The male name was created partly to conceal the gender of the author, and partly to disguise her irregular social position, living as an unmarried woman with a married man. Eliot assured Blackwood - who was at that time unaware of her true identity - that the pen name was necessary to employ 'as a tub to throw to the whale in case of curious enquiries'. 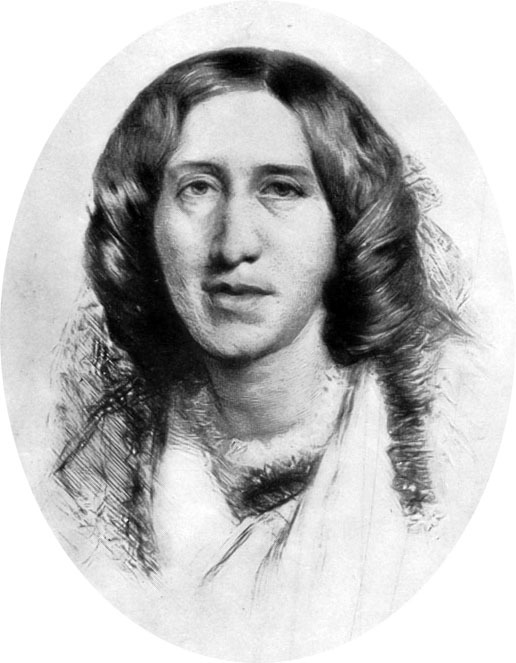 The name George Eliot was used to publish all of her fictional work and ensured that Eliot's novels were taken seriously. Unlike Charlotte Brontë's pen name Currer Bell, which has fallen into disuse, the name George Eliot is still employed today to identify one of the most influential novelists of the Victorian era. Born Mary Anne Evans on 22nd November 1819 to the second wife of Robert Evans, estate manager for the Newdigate family of Arbury Hall in Warwickshire, Mary Anne spent much of her young life in this rural part of England, a childhood which clearly influenced her 1860 novel The Mill on the Floss. A clever and studious pupil, she was allowed to browse in the grand library at Arbury Hall, and in doing so, noticed the disparity between the luxurious life of the family and the tenants living and working on their estate. 'Our vision, both real and ideal, has since then been filled with far other scenes: among eternal snows and stupendous sun-scorched monuments of departed empires; within the scent of the long orange-groves; and where the temple of Neptune looks out over the siren-haunted sea. But my eyes at least have kept their early affectionate joy in our native landscape, which is one deep root of our national life and language'. Formidably intelligent and knowledgeable across a range of subjects: Mary Anne was able to speak several languages including German, Hebrew, and Greek, she translated two books into English that were central to the rejection of Christianity by the intellectual avant-garde: David Friedrich Strauss' Life of Jesus (1846) and Ludwig Feuerbach's The Essence of Christianity (1854). These translations lead to Eliot's atheism and her eventual renunciation of the Christian faith. In 1851, following the death of her father and the subsequent inheritance of enough money to encourage her to live independently from her family, Mary Anne moved to London to pursue a career in journalism. A momentous decision on her part, the transition was accompanied by a change of name. She now called herself Marian Evans, and took lodgings in the Strand, the home and workplace of the political publisher John Chapman. Her position as a single, working woman was highly unusual. On 4 May 1851, Chapman held a meeting to protest against the Booksellers' Association, a group of larger publishers which fixed the price of books, prohibiting small publishers like Chapman from offering discounts. In one of her letters to the Bray family, Marian wrote a lively account describing how Charles Dickens took the chair with 'a courteous neutrality of eyebrow, and speaking with clearness and decision'. Many famous liberals and distinguished men were there: Herbert Spencer, George Henry Lewes (Marian's future lover), and Wilkie Collins to name but a few. Marian Evans was the only woman present. In 1854, she scandalised Victorian society by traveling with the married Lewes to Weimar, accompanying him whilst he undertook research for his biography of Goethe. She and Lewes were now living together openly, and, though they remained unmarried, Marian started using Lewes' name, calling herself Marian Evans Lewes. Lewes would remain highly influential throughout Marian's literary career; he persuaded her to try writing fiction, and he sent her first manuscript 'Amos Barton' to John Blackwood, claiming it was written by a 'shy, ambitious friend'. Her first full-length novel, Adam Bede (1859) was an instant success, bringing wealth to Marian and turning George Eliot into a household name. She became a best-selling author and her fame grew with each publication. One of the most remarkable signs of George Eliot's eminence in the Victorian period was her ability to sell poetry: 'The Spanish Gypsy' had sold over 4,000 copies by the time of its fifth edition in 1875, far surpassing Elizabeth Barrett Browning's Aurora Leigh. In June 1859, Eliot's disguise was removed. Although the public were initially shocked to discover that one of their greatest writers was Marian Evans - a woman in a compromising social position - her novels continued to sell in huge numbers. Her popularity was so great that she and Lewes were invited to social events and dinners despite their unmarried status. George Eliot was even said to be a favourite novelist of Queen Victoria. Just two years after the publication of Daniel Deronda, Lewes died on 30 November 1878, aged sixty-one. Marian was too distraught to attend his funeral. Devastated and bereft at the loss of Lewes, she filled her journal with verses from Tennyson's poem of mourning, 'In Memoriam' (1850), as Queen Victoria had also done after the death of Prince Albert. For months, Marian could not bear to see anyone except Lewes's one remaining son Charles, and the couple's mutual friend John Walter Cross. Marian, still upset over the death of Lewes, married Cross in 1880 despite being twenty years his senior. She reverted to her childhood name, calling herself Mary Anne Cross. However, her new-found happiness was short-lived: Cross fell - or jumped - from their hotel balcony over looking the Grand Canal in Venice. His fall started vicious gossip back in England which speculated over the cause of his apparent depression. The Crosses returned to England at the end of July, and on the 3 December 1880, moved into their magnificent new house on the banks of the Thames. Nineteen days later on 22 December, Mary Anne was to die from kidney failure. Due to her unconventional lifestyle and atheist principles, she was refused interment at Westminster Abbey. Instead, she was buried alongside Lewes at Highgate Cemetery, but in 1980, 100 years after her death, a plaque was erected in Poets' Corner in recognition of George Eliot's literary achievements and lasting reputation. Cite:George Eliot by Charlotte Barrett at http://writersinspire.org/content/george-eliot-0. Accessed on Thursday, April 25, 2019. If reusing this resource please attribute as follows: George Eliot at http://writersinspire.org/content/george-eliot-0 by Charlotte Barrett, licensed as Creative Commons BY-NC-SA (2.0 UK).